Earlier this month, a sophisticated science experiment installed on the International Space Station (ISS) chilled rubidium atoms only a fraction of a degree above absolute zero. The conditions caused the cloud of atoms to change into an exotic phase of matter known as Bose-Einstein condensates (BECs). This was the first time BECs have been created in orbit, which offers opportunities to probe the nature of gravity and unify it with other fundamental forces. There are many jigsaw puzzle pieces that need to be scrambled and fitted before scientists can hope to unify the fundamental forces — and NASA’s Cold Atom Laboratory (CAL) located on the ISS is designed to help in this regard. Recently, CAL scientists announced they had produced BECs from rubidium atoms, which were chilled to only 100 nanoKelvin, one-ten million of one Kelvin above absolute zero (-273 °C; -459 °F) — that’s around 3 Kelvin colder than ambient space. At such low temperatures, the atoms have almost no motion. Free from the chaos of atomic vibration, scientists can now study fundamental behaviors and quantum characteristics that are nearly impossible to do at higher temperatures. This was the first time that BECs have been created in orbit. These were first predicted in the 1920s by Albert Einstein and the Indian physicist Satyendra Bose but it wasn’t until 1995 that scientists were able to produce the necessary conditions for this extreme state of matter to occur, which involve cooling a gas with laser traps down to a fraction of a Kelvin. At room temperature, atoms are incredibly fast and behave akin to billiard balls, bouncing off each other when they interact. As you lower the temperature more and more (remember temperature reflects atomic agitation), atoms and molecules start to move slower. Eventually, once you get to about 0,000001 degrees above absolute zero, atoms start behaving like waves, rather than particles as they ought to on the macroscopic scale. Essentially, the atoms behave like one super atom, acting in unison. This is why BECs are easier to study. 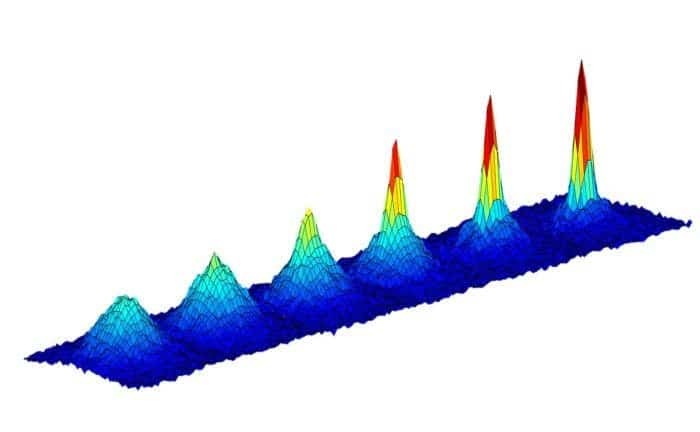 But creating a Bose-Einstein condensate is an extremely difficult process, one that earned three physicists the Nobel prize in 2001 for their groundbreaking work. Even with a pretty solid plan laid out on how to make the condensate, physicists have to painstakingly tweak their process until it’s just right. The Cold Atom Laboratory (CAL) consists of two standardized containers. 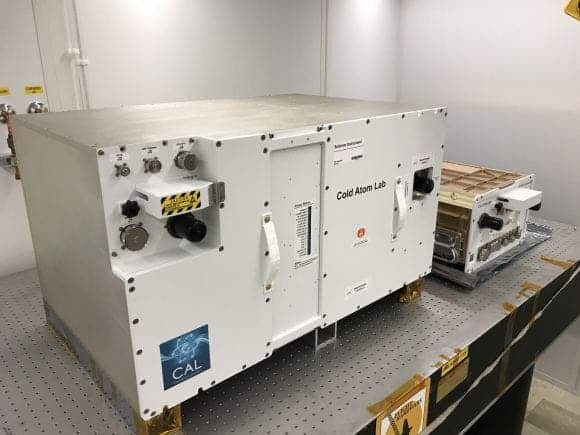 The larger container is called a “quad locker,” and the smaller container is called a “single locker.” The quad locker contains CAL’s physics package, or the compartment where CAL will produce clouds of ultra-cold atoms. Credit: NASA/JPL-Caltech/Tyler Winn. On Earth, BEC experiments require equipment that would fill a whole room and constant monitoring from scientists. The CAL experiment is about the size of a small refrigerator and is remotely operated from Earth Orbiting Missions Operation Center at JPL. Day-to-day operations of CAL require no intervention from the astronauts aboard the station. “It was a struggle and required significant effort to overcome all the hurdles necessary to produce the sophisticated facility that’s operating on the space station today,” said Robert Shotwell, the chief engineer of JPL’s astronomy and physics directorate, in a statement. “Having a BEC experiment operating on the space station is a dream come true,” he added. CAL scientists have their sights set on even lower temperatures, expecting to reach temperatures colder than any BEC experiment has recorded on Earth. They also plan on using other ultracold atoms such as two different isotopes of potassium. Creating BECs in space is desirable because the effects of microgravity enable researchers to study individual BECs for 5 to 10 seconds at a time, with the ability to repeat measurements up to six hours per day. In contrast, BECs are far more unstable on Earth because gravity pulls the atoms, which offers a tiny window of a fraction of a second to study them. CAL is still in its commissioning phase, meaning that engineers are conducting tests to understand how CAL operates in microgravity. Its full scientific potential is, thus, far from having been reached.